Ruby had just given birth to her second and last child. Yes she was pregnant, no she didn't tell anyone. Ruby wanted to keep this one a secret and then when the baby was born surprise everyone! She ended up giving birthday to a healthy baby boy that her and Castiel ended up naming Mark. Gretchen was also pregnant with her third child but for some odd reason this time she was way bigger than before. The family had just celebrated Myles aging up and Gretchen was making sure that the boys got their homework done before they played the rest of the day. She wanted her kids to make great grades that way they had a head start in life but Cian and Myles were very hard headed children. Cian: Mommy if I do this can I have a slice of cake? Gretchen: Now you know you can't have cake in the middle of the day. I'm not even sure you should get any with dinner, because you didn't clean your room mister. Cian: But Moooooom Myles didn't want to help me clean up! Myles: Pfft Cian stop being a big liar, you said let's go draw stuff in the playroom instead of clean. Gretchen: See Cian? Now finish your homework and I'll THINK about letting you have some cake with dinner. 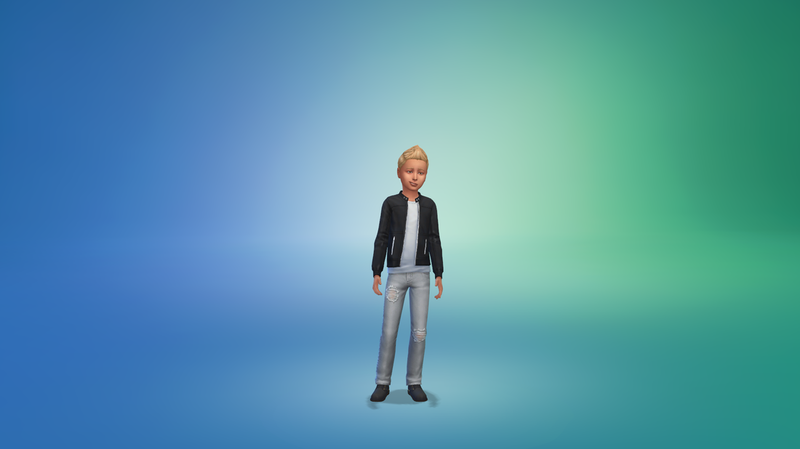 Myles aged up into a little cutie and gained the Genius trait, the first sign of this trait in the main legacy line! He also followed in his brothers footsteps with wanting to become an Artistic Prodigy. 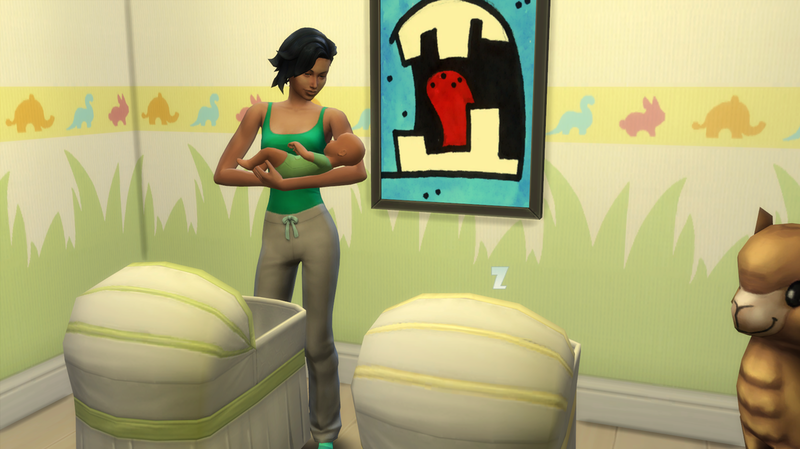 Gretchen had to stop helping the boys because she felt the familiar labor pains starting up again. 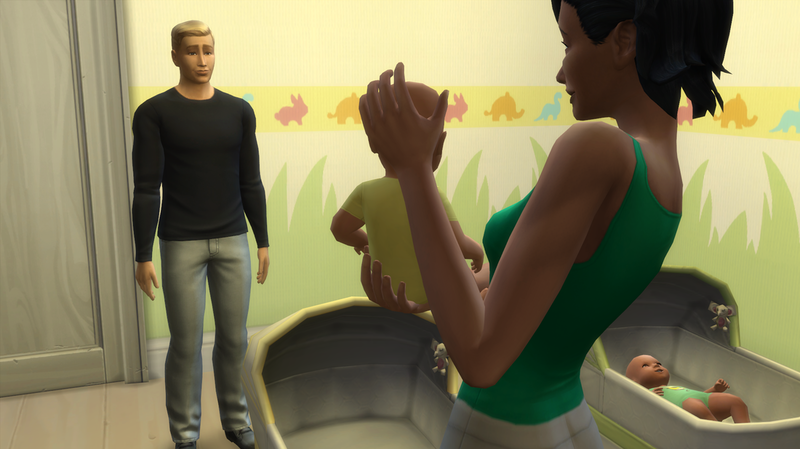 She called Angelo into the kitchen to finish helping the boys with their homework and rushed up the stairs into the nursery to begin the delivery process. While Gretchen was busy upstairs delivering the baby, Angelo was trying to be a good grandpa and make everyone grilled cheeses. But Angelo had never cooked a meal in his life and things did not pan out very well. Cian: Grandpa you're on fire! What do I do?! Myles: Should we go get Mommy?! Gretchen, unaware of the catastrophe going on downstairs, delivered not one but TWO babies. 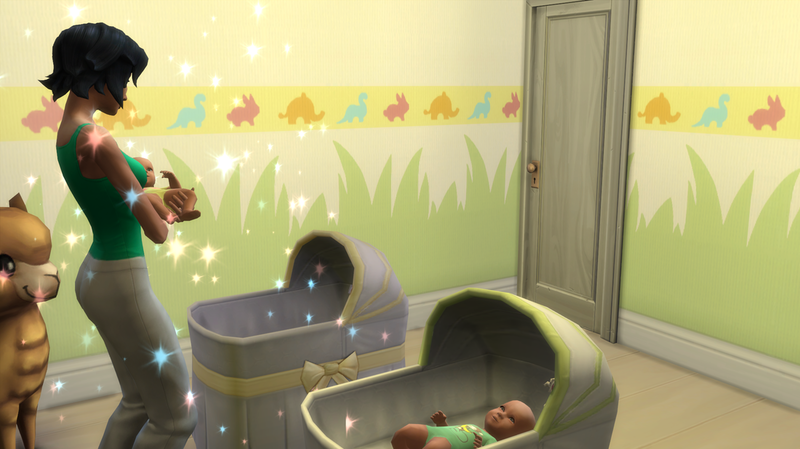 Yes folks that means the first set of twins in the entire legacy has been born! Please give an warm welcome to Celine and Jax Belle! Gretchen: I finally have a baby girl! Oh I'm so excited, for a while there I thought I would be over run by men in this house! 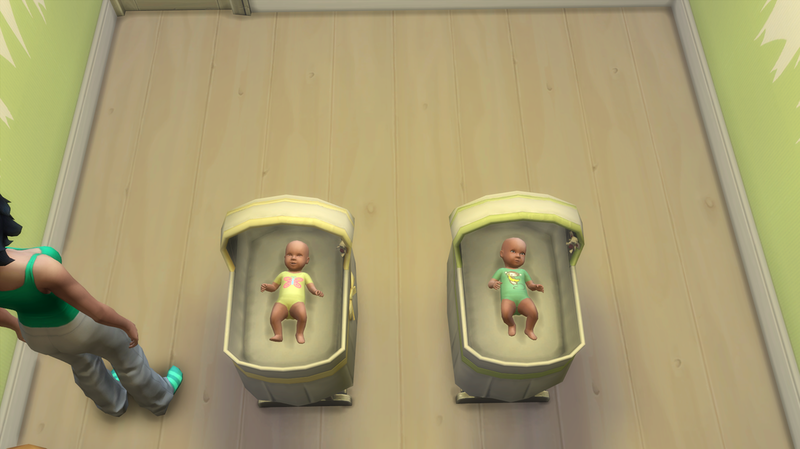 I can't believe I had twins! Well I guess it makes sense, since I am a twin. Ohhh I wish I could hold you both, Mommy loves you both so much! Here is just a cute little above picture of the twins. So precious! Meanwhile, downstairs Angelo had managed to put himself and the fire out with little incident. The boys had run out of the kitchen looking for their dad but by the time Damen had gotten downstairs Angelo had it under control. Angelo: Oh for plum sake! The ONE time I try and eat something other than cake and this happens! If you're seeing this Sunny I hope you know I at least tried! 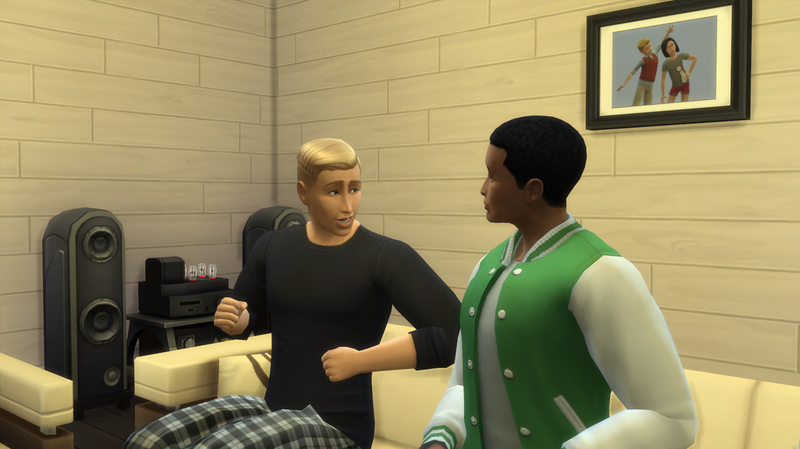 After Damen scolded his dad for even attempting to make any food he headed back upstairs but then realized he hadn't seen Gretchen in all this commotion. He knew for a fact that she would be freaking out over all of this if she even knew what was going on. 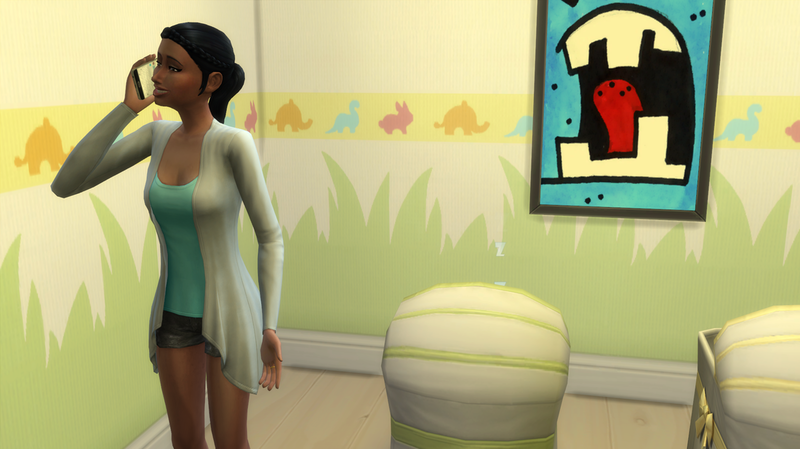 Damen heard a ruckus coming from the nursery and walked in to see Gretchen holding a baby in a yellow onsie with a butterfly on it. Gretchen: Do you want to meet your daughter, Damen? Damen: I...have a daughter now? Gretchen: You do. And your daughter has a twin brother too. Damen: Wait. You had twins?! Maybe that's why you were so big..
Gretchen: Well excuuuse my big belly! Damen: Hey I'm just saying but you took up like half the bed there. Gretchen started to laugh and that made Damen crack a smile. He walked over to his wife and daughter and motioned to Gretchen asking if he could hold Celine. Gretchen: Just be careful okay? Damen: I will, I will. Damen took a hold of Celine and slowly rocked her back and forth. Celine looked up at her dad and gurgled happily, she reached up and made grabby hands causing her dad took stick his index finger inyo her little palm and coo at her quietly. Gretchen stood back and watched the scene unfold while her heart and stomach filled with warmth. 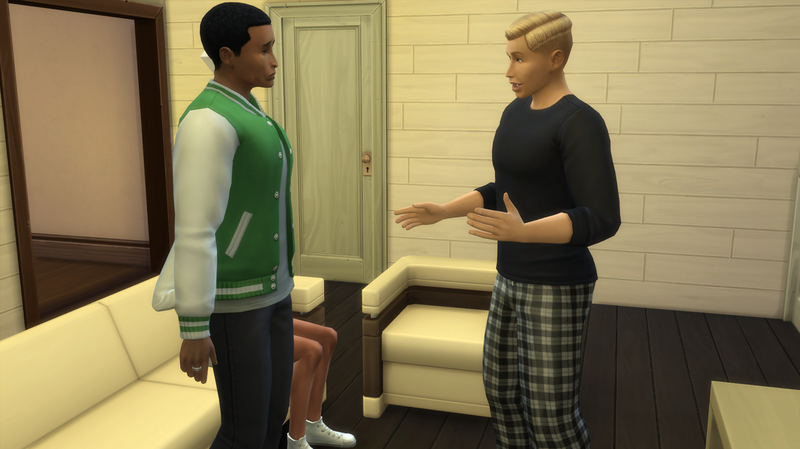 Damen also paid attention to his other new son, Jax. He made a statement saying that he could already tell that this one was going to be an athlete, which caused Gretchen to roll her eyes and sigh. Gretchen: Men and their sports. After Damen had left Gretchen picked up Jax to show him some attention and lovins'. Gretchen: You're the youngest one out of the bunch now, since your sister was born before you. If your brothers and sister ever pick on you, you stand up for yourself. You're going to be a big strong boy, I can already tell. As you all know with births come birthdays and the birthday for today is the hot-headed Isabellas! Grace and Starks daughter grew up into a beautiful teenager and gained the Neat trait. A hot-headed neat sim, interesting. 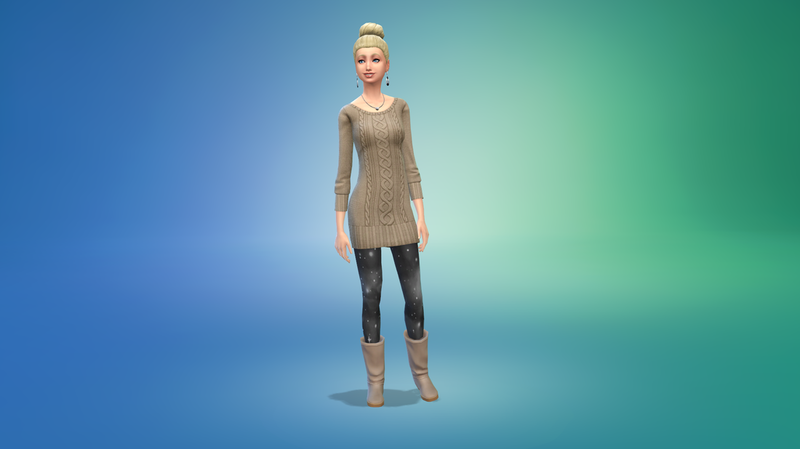 She also wants to become a Renaissance Sim and learn anything about everything! After Gretchen finished doting on the twins she went to go take a nice warm bath and when she had finished she had just gotten back into the nursery when she got a call from a private number. Gretchen: Hello this is Gretchen Belle speaking. Man: Yes hello, you don't know me but I am someone you should know about if you are going to continue being married to Damen Belle. I'm not sure he even knows about me himself. Gretchens face paled and a million thoughts were running through her head. Was it the police? Was it a private detective that someone had hired in the other Newcrest? Man: Meet me at the address that I have texted to your phone. See you then. And with that the phone line was dead. Quickly Gretchen grabbed her purse and car keys and plugged in the address into her GPS. She had to find out who this was and if they were going to blackmail her out of some money or if they were going to threaten to take her to jail. When she arrived at the address she got out of her car to see a tall teenage boy standing nervously near the sidewalk. When she approached him he smiled kindly and waved. Gretchen: Are you the guy from the phone? Guy: Yea..I'm sorry we had to meet like this. Gretchen let out a relieved laugh and shook her head, causing the boy to look at her quizzically. Gretchen: Nothing, nothing. Anyways who are you and how did you get my number? The boy motioned for Gretchen to go to the front porch and put a finger up to his lips telling her to speak quietly. Guy: Okay first of all my name is Dante Couch. You might remember hearing about my mother Noemi Couch in the newspapers a long time ago? Yea well I'm Damens son. Gretchen: So...Dante. Why did you want to bring this to my attention? Dante: Well I found your number in the phone book and my mother just recently passed away. She died at her job. See she wanted to win my dad back by becoming more like him so she joined the criminal career but my mother wasn't cut out for it and she got into trouble all the time. One day she just never came home from a heist and her boss came by to tell me the news. So now I live here with my grandmother and my uncle and I at least wanted my dad to know about me. My mom thought if she could win him back that then she could tell him that she had his baby, but as you can tell, that never happened. Gretchen slowly nodded her head and reached up to pat the kids arm. She felt bad for him and at least wanted Damen to meet him. Gretchen wasn't upset at the least that Damen had an illegitimate child, for plum sake she expected him to have more out there. Gretchen: Come back with me to the Estate and I'll introduce you to your father. I promise this isn't a trick, he should at least know you exist. Dante agreed and it was a short drive back to the house. Gretchen listened to Dantes upbringing and what he was doing right now. She figured out he was a star football player and made straight A's and had a full ride to a very prestigious university. After Dante was done talking he asked her how her and Damen met and she was glad that they came up on the house because she did not want to have to answer that question. 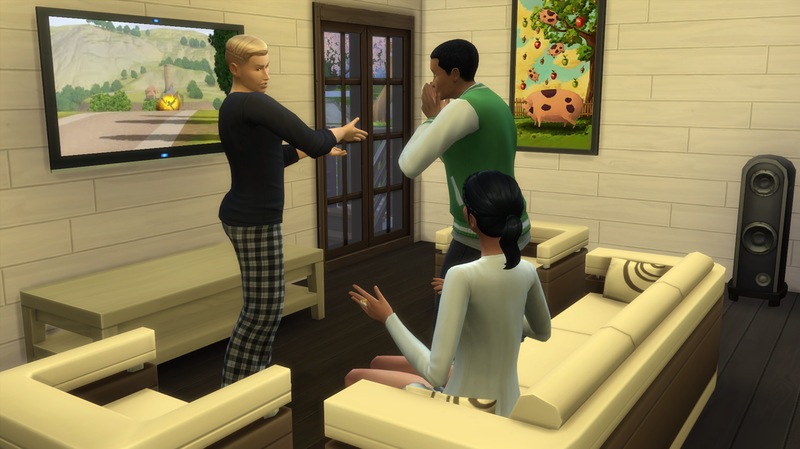 Gretchen led Dante into the living room where Damen was sitting down watching TV. Damen looked up and smiled at his wife and looked questioningly at Dante. Dante sat down on the sofa and smiled at his dad, he was finally getting a chance to meet him. Gretchen: This boy has something he wants to tell you and I want you to hear him out Damen. Dante: I'm your son. My name is Dante Couch and my mother was Noemi Couch. Damen: Oh this is some kind of joke right? Wow Gretchen if you wanted me to smile you could have hired a clown or something! I didn't know you had it in you to play such cruel jokes! Gretchen: He is your son Damen. I listened to his whole story. Just look at his face, his build, for plum sake his eye color! He.is.your.son. Damen: Okay son, enough with the jokes. How much did my wife pay you to do this? Dante: I didn't get paid anything. I am your son. You were the only person my mom was ever with and she got pregnant after you did stuff and then left her. Damen: Listen, if that is the case why the plum did you want me to know? Are you expecting some sort of money or payment for being a legacy kid? Because that is not what you are going to get from me, boy. Damen: Pfft, if you wanted to meet me your mother would have brought you to me sooner. If you're thinking you have ANY chance at winning the heirship you are wrong. It goes against the rules. You were not born in this house and I was never married to your mother. Damen: And YOU, sit down! You should have never brought this boy here! Do you want it to be all in the papers that I have an illegitimate child?! Gretchen stuttered and quietly sank into the back of the sofa. Damen: And you, Dante. You aren't getting any of my families money and I don't want to see your face around here ever again. You are an illegitimate son and you were a mistake that I should have never made. Now get out of my house and off my property.